"Challenges of managing today's employees"
Professor of Leadership Development Manfred Kets de Vries and Professor of Organisational Behaviour Michael Jarrett comment on the challenges faced when managing employees today. "Leadership lessons from Alexander the Great"
This article explores what makes for effective leadership and what contributes to leadership derailment, using Alexander the Great of Macedonia, as an example. "Talented leadership in the European Union"
This article explores the complex network of relationships requires extremely talented leadership in the European Union. "Narcissistic leaders and organisational sustainability"
Ethics in Business—Where is the education for narcissistic leaders? This article explores the narcissistic inclinations of leaders and how this could affect the soundness and sustainability of organisations. 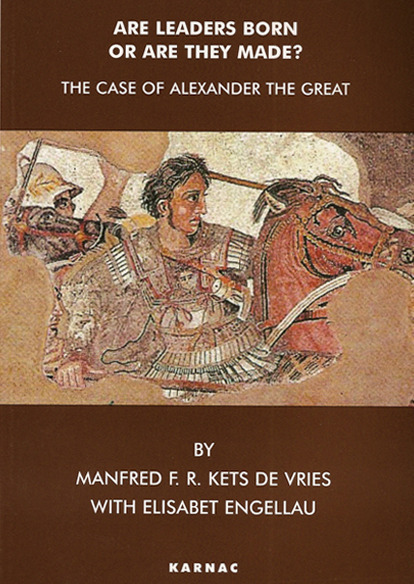 This book is an easy-to-read overview of all the key events and people in Alexander the Great's extraordinary life, and provides lessons on effective leadership. "Group coaching second to none to have executives sing on the same page"
This article illustrates how group coaching can be a methodology second to none, to have executives sing on the same page—and accelerate execution. It is an intervention methodology increasingly utilised by premier strategic consulting firms. "Unhealthy dependencies prevent leaders from reaching their full potential"
In this article for Human Capital Review, Kets de Vries explores the Rescuer Syndrome—where the need to help becomes a self-serving addiction and—which creates an unhealthy state of dependency and prevents leaders from reaching their full potential. "What are the strengths of German managers?" Manfred Kets de Vries gives an interview to Germany's Harvard Business Manager, in their special on German Management. "HR leaders as catalysts for change"
Craig Donaldson from Inside HR speaks with Manfred Kets de Vries about the evolution of HR, its role in change and why leaders need to lift their game. "A profile of Ruben Vardanian, a leading figure on Russia’s capital markets"
"Leadership in a digital age"
To become more effective and refective leaders, executives need to learn to improve their behavioural reactions to diffucult situations and develop greater emotional intelligence.